Arguments surrounding tax rates will soon come to the forefront of election campaigns in Sweden, after the current Prime Minister began national discussion by ruling out tax cuts for 2011 if his party is elected. Speaking to journalists on July 4th Fredrik Reinfeldt, Prime Minister of Sweden and leader of the Moderate Party, adamantly ruled out the possibility of cuts to personal tax rates in 2011, if his party is reelected. He conceded that the only possible exemption to the tax policy will be pensioners, as Fredrik Reinfeldt had previously promised an easing of tax burdens for the elderly population in the economy. According to Fredrik Reinfeldt, the best course of action for the Sweedish economy is to concentrate on job creation and economically beneficial Government social programs, with tax cuts being reserved for a healthier economic time. Mona Sahlin, leader of the Swedish Democratic Party (SDP), has not yet revealed a concise plan for her party’s tax policy. However, she has indicated that, if elected, the SDP will be focused on ensuring Sweden’s recovery from the worldwide economic recession, primarily through extended job creation fiscal and social policy. Mona Sahlin has also stated that her party is considering instating a “wealth tax” and raising personal income taxes. Although any increased tax revenues will be offset by heavily increased social programs and welfare arrangements. Maria Wetterstrand, leader of the Green Party, is expected to reveal a full tax plan soon in response to Fredrik Reinfeldt’s statement. She has previously criticized the current Government’s tax cuts as not being adequately geared towards environmental protection. She claimed that the Government has been too concentrated on tax rates, with little regard to health of the Swedish population and environmental proection. Political analysts have acknowledged Fredrik Reinfeldt and Mona Sahlinas the primary candidates for the election in September. 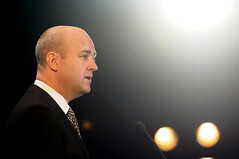 Currently Fredrik Reinfeldt is polled as a stronger leader, with his party receiving marginally better approval in opinion surveys. Although, some experts have revealed surprise at the withdrawal of future tax cuts and policy choice resembling that of the SDP, with questions being raised to the uncertain affect the policy choice will have with voters and taxpayers.